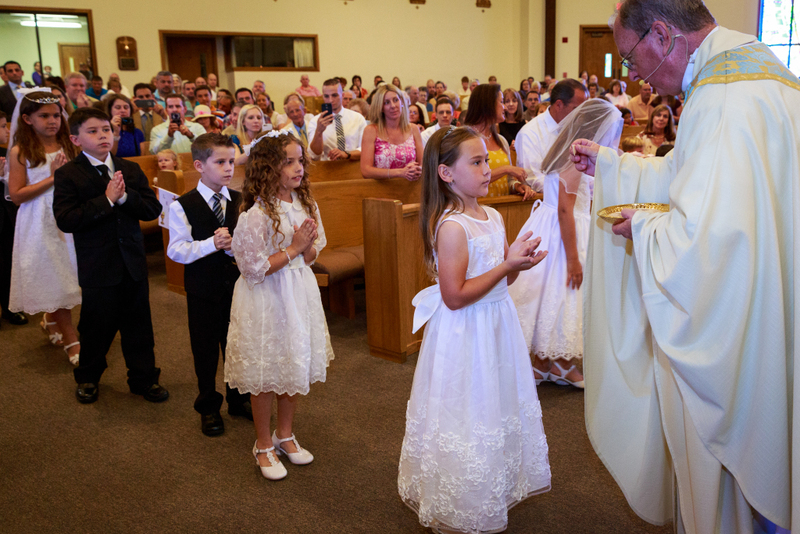 For information about receiving the sacrament of first Holy Communion, please call the Valeta Orlando in the Faith Formation Office at (386) 441-1505, extension 307. In order to enroll in the Sacramental Preparation program you must be a registered member of the parish. The Sacraments of Reconciliation and Eucharist are offered to children in second grade or older. Your child must be enrolled in St. Brendan's Faith Formation program or in St. Brendan Catholic School to in order to prepare for a sacrament at St. Brendan. Classes meet on Sunday mornings from 10:45am-11:45am. There are four classes for First Reconciliation and four for First Communion. A class calendar is available HERE. Only one class absence is allowed. If you know ahead of time that your child will miss more than one class, you should contact the Director before registering. First Eucharist is a sacrament of initiation; it is important that your child is an active member of the parish community into which he or she is being initiated. We plan our program under the assumption that your child regularly attends Mass. Children must receive the Sacrament of Reconciliation before they can receive First Communion. Sacramental celebrations and Sacramental Preparation take place within the parish community. It is not a “school” celebration. Students enrolled in St. Brendan Catholic school but registered in another Catholic parish must receive the sacrament in their home parish or provide a letter of permission from their pastor..
Holy Communion augments our union with Christ. The principal fruit of receiving the Eucharist in Holy Communion is an intimate union with Christ Jesus. Indeed, the Lord said: “He who eats my flesh and drinks my blood abides in me, and I in him.” Life in Christ has its foundation in the Eucharistic banquet: “As the living Father sent me, and I live because of the Father, so he who eats me will live because of me,” (Catechism of the Catholic Church #1391).